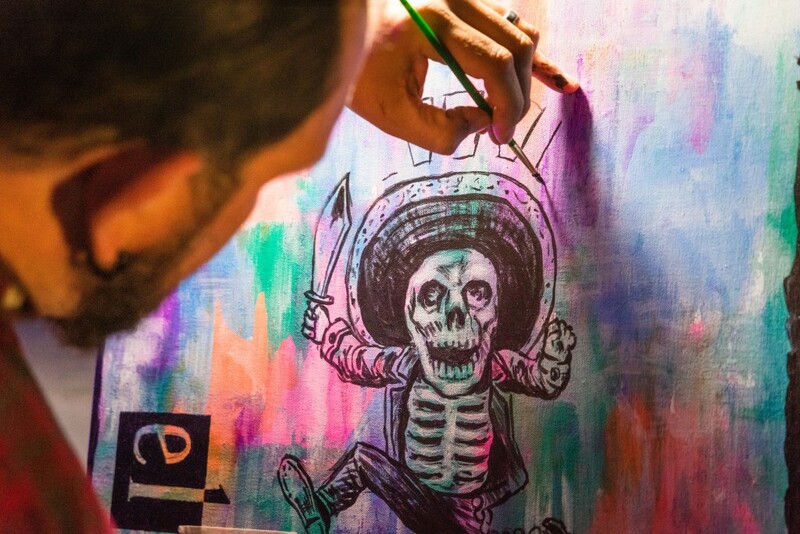 On a chilly autumn evening in the heart of Downtown LA, the last day of GYPSET Magazine’s Street Art Series took place at Don Chente Bar-Grill Lounge. 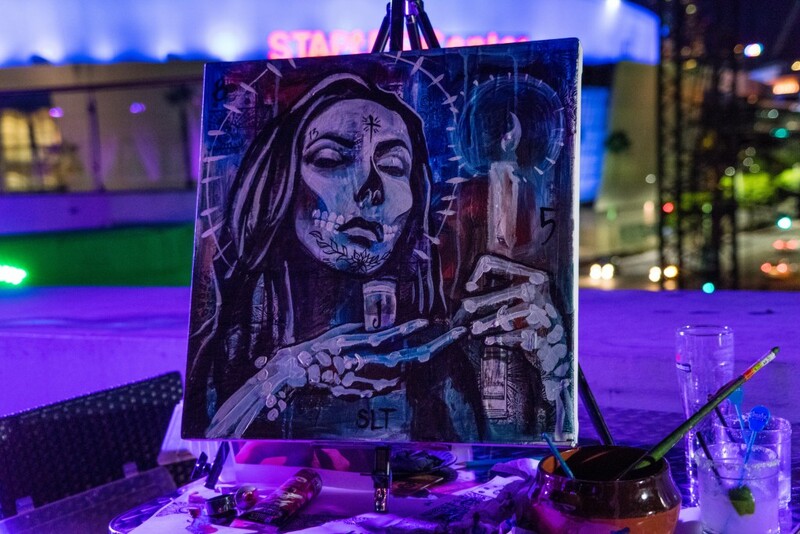 The 4-day series featured up and coming artists from Los Angeles competing against each other for a $500 cash prize and an opportunity to display their masterpiece at the El Velorio “A day of the dead multicultural event” at the Plaza De la Raza on November 7, 2015. Each day of the series, three different artists were featured and given a blank canvas along with the painting tools necessary to create their individual works of art in a span of 3-hours as guests looked on in admiration and curiosity. 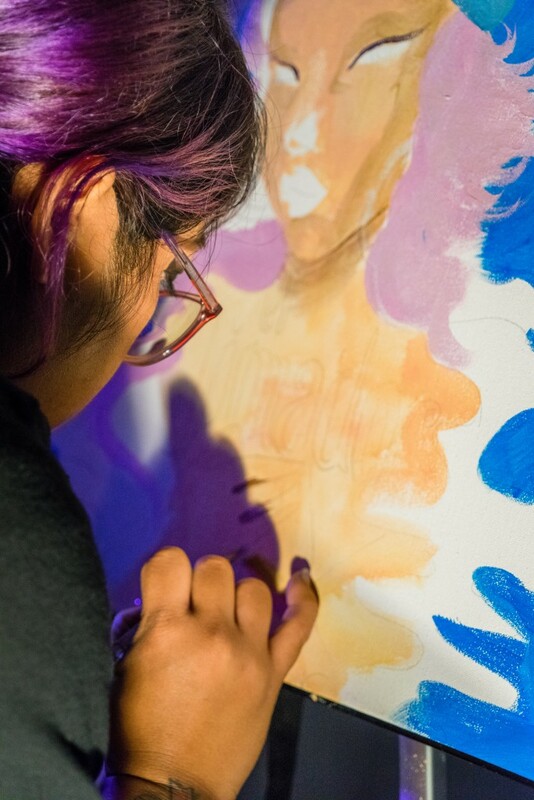 The event allowed guests the opportunity to connect with the artists on a creative, personal level as they witnessed the artistry and creative process of an artist in his/her environment. The theme for the evening was to develop a piece for the Jimador Tequila brand, the co-sponsor of the series, using the Day of the Dead holiday as a backdrop. 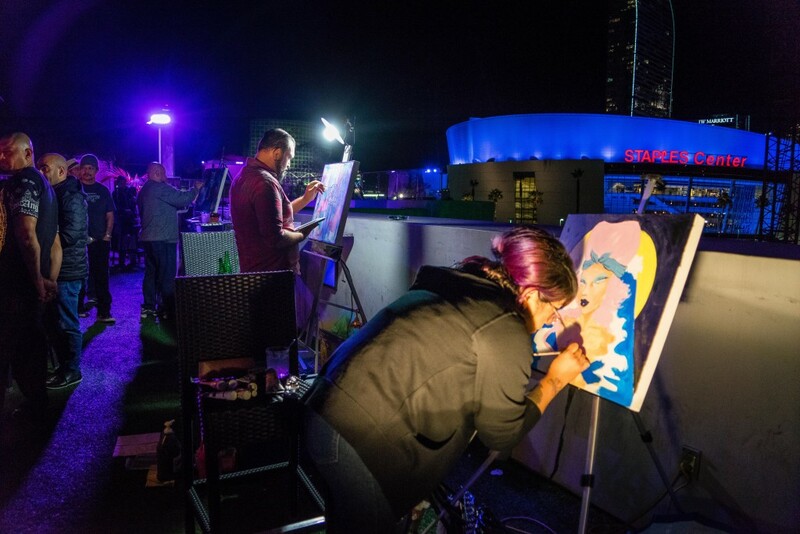 The featured artists, Lekit, Eric Almanza, and Pablo Damas, worked tirelessly under the open night sky on the roof of the Mexican restaurant conveniently located across the Staples Center. While Laker fans cheered their favorite basketball team across the street, these talented artists toiled under 53 degrees of icy weather drawing and painting original pieces off the cuff. The entire evening was filled with guests walking past each artwork admiring the brushstrokes and colors while chatting with fellow artists and writers who attended to support their favorite contestant. Guests would vote on their favorite artwork and the winner would then be announced by the end of the night. Each artist had successfully given their masterpiece their own personalized stamp as they followed the evening’s Halloween-inspired theme. Lekit, inspired to represent female empowerment and raw beauty, took a majestic approach displaying her female subject as a god-like, earthy, street monarch against a backdrop of a dreamy night sky with a full moon rising in the background. The painting suggests Mother Earth looking over her children from high above the clouds. With dynamic lines and the use of the night light, the subject looked like an Egyptian queen sphinx. Powerful yet nurturing. Eric Almanza called his piece, “El Borracho” (The Drunk). Using bright colors and adding an Impressionistic sensibility, Eric has his skeletal caricature running across the canvas in full festive glee complete with sombrero and a buoy knife. Sporting a grim yet endearing smile, El Borracho runs toward the Jimador logo with the fervor and anticipation of a loveable drunk ready to continue the rumba late into the evening. Then, there was “Salud” by Pablo Damas. Describing his piece as a tribute to all the loved ones who have passed away throughout time, Pablo went with the Day of the Dead theme and ran with it head on holding nothing back. At first glance, the painting pulls the audience in like a circus fortune teller calling passersby into her tent. One cannot help but approach her and inquire what she has to offer. Think of it like a mix between Da Vinci’s Mona Lisa and an Edgar Allen Poe poem. Beautiful, dark, and mysterious best describes the piece. Pablo’s subject is a woman of the night holding a candle illuminating her defined, slender face with one hand while holding a shot of tequila with the other. Her hair is long and black as night with a cross imbedded on her brow. She offers the audience a toast as her literally boney hand serves up her drink. It is truly mesmerizing leaving no doubt that Pablo’s work won the prize for the evening. 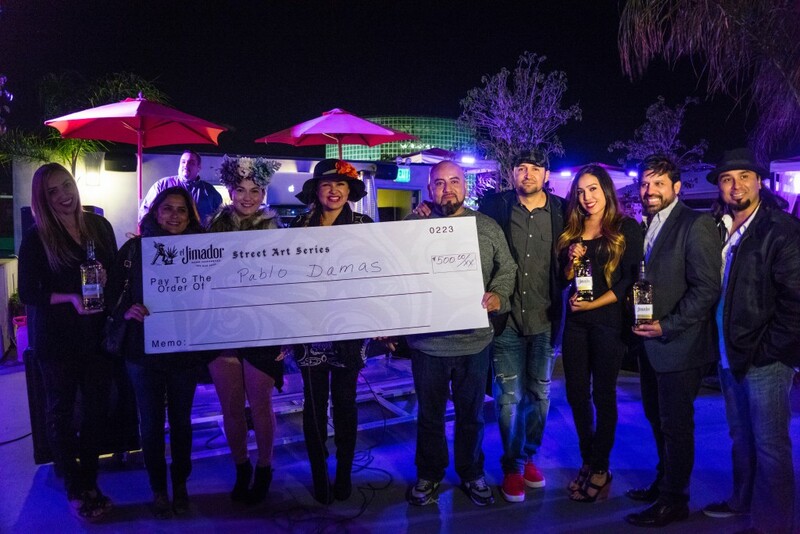 Other prizes were raffled off like a skateboard signed by Paul Rodriguez and a limited edition Frida Kahlo print portrait done completely by a mechanical 2b pencil by Antonio Pelayo whose works have been on display in over 200 galleries and museums worldwide. In addition, attendants had an opportunity to win an ink and paint tour of Antonio’s work at the Walt Disney Animation studio. Complimentary Jimador samplers were distributed to guests in cute orange-colored souvenir shot glasses that it was a shame to throw away when the night came to a close. The restaurant kept attendants well fed with tasty finger foods from their warm kitchen downstairs; while, the DJ kept the music going playing a varied mix of Top 40’s hits, hip hop, reggaeton, bachata, etc. It was definitely a pleasant and enjoyable night of street art and LA cultural fusion. Thanks very much, glad you enjoyed this post! Keep cheickng back for more delicious food and drink recipes. By the way, I absolutely LOVE your store!